The strength of a nation’s Business Environment is a critical factor in determining its prosperity. A strong business environment provides an entrepreneurial climate, enabling new ideas and opportunities to be pursued, which lead to more wealth and greater social wellbeing. 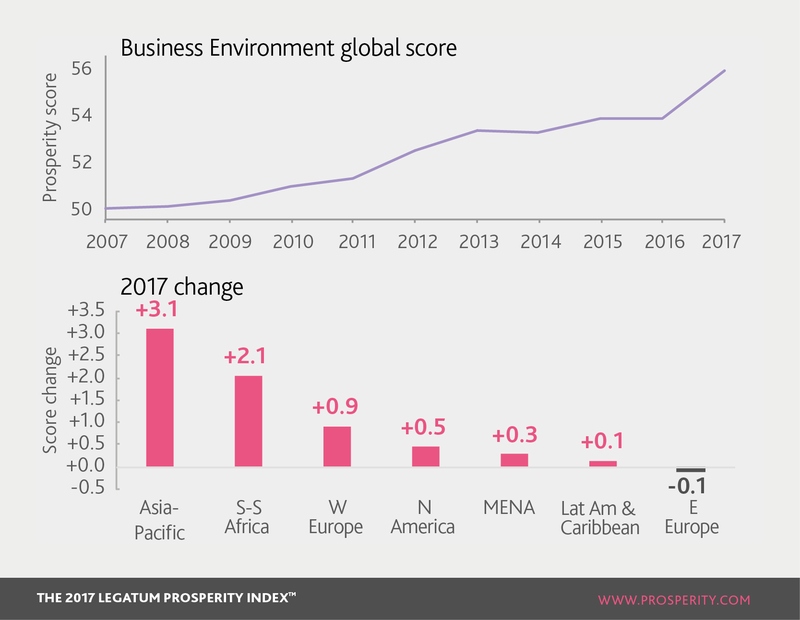 The world’s Business Environment has improved more than any other of the nine pillars in the last decade, increasing in score by more than ten percent. Compared with ten years ago, it is now easier to start a business, investors are better protected through property rights and insolvency procedures, and business infrastructure is much improved. In 2017 only Eastern Europe failed to improve – while Asia-Pacific grew more than any other region. Entrepreneurial Environment assesses whether businesses are easy to start and run, and how easy it is to get ahead. Oman has recently removed the requirement to pay minimum capital within three months and streamlined employee registration for businesses. Despite having the world’s best business infrastructure, Japan ranks 137th in the world for entrepreneurs due to complicated regulations around starting a business. Business Infrastructure examines the infrastructure that enables market access for individuals and firms, which includes transport/logistics, utilities and communications. South Africa saw the largest increase for this sub-pillar, due to reduced electricity connection costs and an improved Logistics Performance Index. It was followed by India and Tanzania. Only Latin America and the Caribbean saw its Business Infrastructure score fall among regions, as the cost of obtaining electricity increased. Access to Credit assesses whether individuals and businesses are able to get credit at an affordable rate to finance their ideas and thereby foster entrepreneurship. Pakistan’s business gains in 2017 came through increased access to credit – specifically by guaranteeing borrowers rights to inspect their own data and the credit bureau expanding its borrower coverage. El Salvador by contrast fell fastest in the world in Access to Credit, as ease of getting credit worsened. Investor Protections measures the strength of rules around ownership and rights, particularly around intellectual property. India‘s gains in Business Environment were driven by improving intellectual property rights. Qatar saw its score fall, as resolving insolvency became more difficult. Labour Market Flexibility measures the ability of businesses to adapt to new challenges by hiring people they need, or to losing people and positions they don’t need, without being impeded by costs and regulations. Businesses in the Netherlands, Germany and Norway are perceiving increasingly fewer regulatory barriers to hiring and firing. Australia is the only country in Asia-Pacific to have increased the cost of redundancy in the last 10 years.